When you say, poultry breed, most people do think about chickens. There is a lot of diversity in poultry which includes waterfowl, like ducks and geese, turkeys, and many other varieties of birds. Chickens have been a cornerstone of food production across the world for thousands of years. 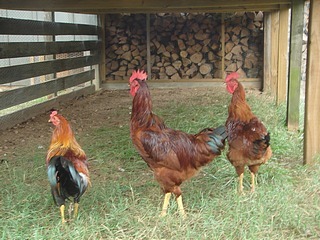 Below is a continuation of the many different chicken breeds. Japanese Bantam: a showy ornamental truly bantam breed. Java: the second oldest American breed behing the Dominque. Jersey Giant: the "big boy" of the chicken world. Kraienkoppe: the German ornamental layer. La Fleche: the ornamental French dual purpose bird. Lakenvelder: this German breed is a good layer of small white eggs. Lamona: the rare American breed. Langshan: the old Asian breed that is a good dual purpose bird. Leghorn: a popular breed that are great layers of large eggs. Malay: the tallest breed of chicken. Manx Rumpy: the Persian breed that is a good free ranger. Marans: these birds are a great dual purpose bird and are known for their dark brown eggs. This is an old Spanish breed and the largest of the Mediterranean. Modern Game: a tall and very distinctive looking bird. Naked Neck: one of the oddest looking birds in all chickendom. Nankin: they are a rare true Bantam breed. New Hampshire: a good dual purpose bird, especially if you have a meat focus. Norwegian Jaerhon: this is a small bird that lays a large white egg. Old English Game: they are a very hardy and feisty ornamental breed. Orloff: the Middle Eastern breed that are used as broilers. Pekin: The Chinese bantam breed. Penedesenca: this Spanish breed lays a really dark egg. Phoenix: The ornamental breed with the long unique tail. Polish: they make for great entertainment and great pets. Red Shaver: The common Canadian breed that is calm and quiet. Rhinelander: the German breed with dual purpose potential. Rhode Island Reds: the classic American breed. Rhode Island White: a good dual purpose breed. Saxonian: the ancient German breed from Saxony. Shamo: the second tallest breed of chicken that stands about 30 inches high. Silkies: these guys are very unique and make excellent pets. Silver Laced Wyandotte: the workhorse of the dual purpose breeds. Starozagoska Red Chicken: the rare Belgian cross breed. Sulmtaler: the breed that was developed in Austria. Sultan: the choice of Turkish royalty. Sumatra: the stylish breed with the lustrious plumage. Sussex: the old English breed that makes a great dual purpose bird. Thuringian Bearded Chicken: the old, rare German breed. Welsummer: this breed is known to be the best free range forager of all egg-layers. Westphalian: The ancient self made breed. White Faced Spanish: the old Mediterranean poultry breed that is a good egg layer.